Casino Luck will then reward you with a bonus (Welcome Bonus is for new players only). The terms and conditions of the bonuses vary between different casinos and might also change over time and between different countries, so it is important to compare the different offers and read the T&C for Casino Luck before signing up. 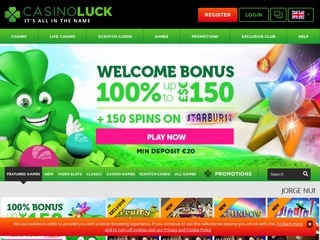 CasinoLuck is one of the veterans of the online gaming scene, inviting players to try their luck in a completely safe environment hosting 500 games by the likes of NetEnt, Microgaming, NYX and BetSoft. On their colorful and cheerful website, everything is just a click away – a collection of close to 500 casino games, multiple options for boosting one’s balance, and Live Chat function available to those in need of assistance. New members are offered to claim 100% bonus up to $150 plus 150 spins and collect reward points exchangeable for bonus money and prizes. The CasinoLuck is owned by Minotauro Media and their games operated by Aspire Global International. Safety and fair treatment are pretty much-guaranteed thanks to licenses issued by the MGA and the UKGC, while iTechLabs certifying all games will deliver random outcomes. 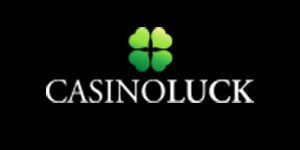 CasinoLuck offers instant access to more than 300 slots, a dozen RNG table games, a generous collection of Scratch Cards, and a large assortment of highly realistic live dealer games. They’re able to do so thanks to NetEnt, Microgaming, NYX, BetSoft, iSoftBet, Blueprint Gaming, Lightning Box, Pragmatic Play, 2by2 Gaming, GameArt, Habanero, Booming Games, PariPlay, Inspired Gaming, Amaya, Merkur, Ainsworth and Casino Technology. This diverse library is available on desktops and mobile devices, with all non-live games offered to be tested for free. Featured Games tab provides quick access to the Casino’s most popular games, among which Gonzo’s Quest, Dead Or Alive, Thunderstruck II, Jungle Jim El Dorado, Dragonz, Foxin’ Wins and Hugo. Though there are no doubt players will be happy to play these familiar titles over and over again, it’s nice to see the Casino also offers all of the most recently released slots. NetEnt’s Double Stacks might appeal to fans of video slots as well as those into classics; traditional symbols such as cherries, diamonds and BAR icons are presented in attractive 3D clothes, Wild star helps create winning combos, 4 highest paying symbols appear stacked, Double Stacks feature replicates them, and Scatters launch free spins with stacked substitutes. BetSoft’ Alkemor’s Tower features typically beautiful visuals and offers 243 ways to win. Combining Spell Books with Elemental Symbols launches one of four Elemental Spells, and as the result, one will see symbols transformed into Wilds plus an extra piece of magic depending on which spell has been activated. Free spins play on one of the floors of Alkemor’s tower and use a completely new set of icons including the devouring Vine and Black Hole symbols. Hot Spin by iSoftBet is another classic-looking title with interesting extras. The 5×3 reel area has been topped with a Hot Wheel which one can activate by landing bonus symbols on reels 1, 3 and 5. Spinning it awards free games with one special feature – either mystery symbols, random Wilds, Wild reels, guaranteed wins with a multiplier, colossal reels, in-sync reels, or Hot Spin. Though CasinoLuck did make sure to also please fans of table games, they’re doing it more generously within Live Casino than RNG section. Still, one can play Classic and Blackjack Solo, European and Royal Roulette, and 3 Card Solitaire. The same section stores a few Video Poker games, namely Jacks Or Better, Joker Poker and Deuces Wild. The collection named „Scratch Cards“ provides a further choice of 60 other casino games, among which Scratch N’ Roll, Crazy Ball, X&O, Monte Carlo Dice, Bingo and Hi Lo 54. The operator’s Live Casino is powered by Evolution Gaming so one knows they’ll be offered an exceptionally large and diverse choice of high-quality live dealer games. There are more than 50 tables to take a seat at and play Lightning Roulette or one of several live native Roulette games, pick among a large number of Blackjack tables with different betting limits, bet in a game of No Commission, Speed, Squeeze or Control Squeeze Baccarat, or enjoy unique Live Dream Catcher. Blackjack is also played in Salon Prive which caters to high-rollers. Casino Luck accepts payments in EUR, GBP, USD, CAD, AUD, and JPY. Players get to choose from a fairly long list of deposit options which include Visa, MasterCard, Maestro, Skrill, Neteller, Trustly, Sofort, Entropay, ecoPayz, Eps, Euteller, InstaDebit, Mister Cash, PaySafeCard, Zimpler and Bank Transfer. Withdrawal requests are processed within 2 business days and cashout limits set at $10 minimum per transaction and $7,000 maximum per month, though VIP Platinum members are allowed to collect larger amounts. The operator provides on-site support via a comprehensive FAQ list which addresses questions related to privacy, bonuses, payments, reward point program, technical issues and general information. Another option is to contact the support team available 7 days a week from 8am to 1am CET. Players can call them, send an email, or launch Live Chat as the fastest way to receive the needed assistance.